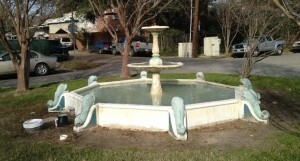 The Hyde Park United Civic Association is asking our neighbors to help restore the historic Dolphin Fountain on the corner of Hyde Park and Waugh. Dating from 1946, this fountain is believed to be one of the oldest continually operating water features in the city. But almost 70 years of Texas summers, along with a colorful life lived entirely in Montrose, has taken a toll on this quirky neighborhood mainstay. The Dolphin Fountain Restoration Project seeks to return the fountain to its former glory. Plans are now underway to repair the fountain and beautify the area surrounding its base. Landscaping will be enhanced and light features will be added so that you may enjoy the fountain at night. FULL FUNDRAISING BROCHURE: Click Lamar Park Brochure – Dolphin Fountain.August2014 to download the full brochure. DONOR RECOGNITION LEVELS: All donations received through at least the end of 2014 will be eligible for the DONOR RECOGNITION outlined below and in the full fundraising brochure. All donors meeting one of the three recognition levels will be contacted when the work begins for your recognition name. ** Funds must be secured prior to start of project. All work must be completed through the Houston Parks Board. 4. LAMAR PARK (found in the drop down box). This selection required to direct your donation to our restoration project and receive recognition. APPROVED PROJECT PLAN: Click Lamar_Park-Dolphin_Fountain_Restoration_Plan_8-13 to download the plan as approved by the Houston Parks Board and the Houston Parks and Recreation Department. Map: See where the fountain is located on a map of the civic association. CLICK for map.